I decided to combine these two reviews together because both are relatively short. 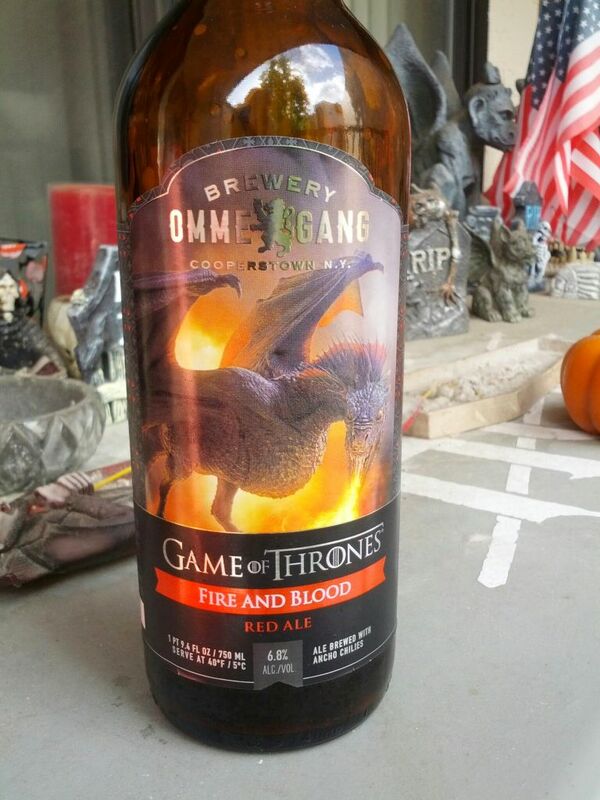 First off we have the latest Game of Thrones beer from ommegang brewing. This one is called Fire and Blood in honor of House Targaryen. My friend got a bottle and invited me over to try a taste so I jumped at the opportunity. 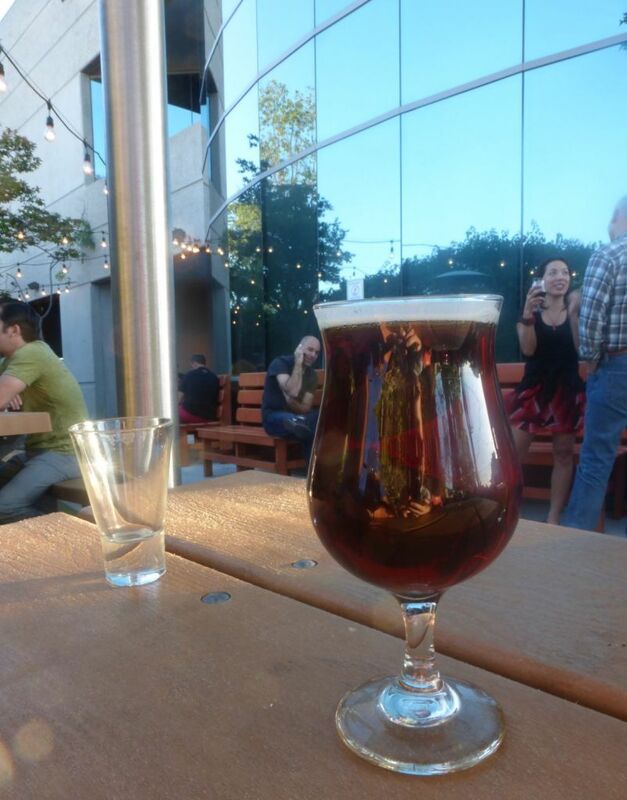 The beer claims to be rich and malty while sporting some spicy flavor from Ancho chilies and a bit of rye. Game of Thrones Fire and Blood Beer. The beer pours a nice amber color and smells sweet like a Belgian beer. It has a good sweet Belgian flavor with fruity malts coming through nicely. The spicy flavor is relatively mild though it has a decent kick. Compared to other beers, this is closer to Green Flash’s Serrano Double Stout and not anywhere near the Habanero Sculpin. I was generally satisfied by the beer as I continued to drink it. Though it doesn’t burn going down, the spicy flavor does work well to balance out the malts. For my second beer of the night, I tried the latest IPA from Widmer Brewing. My friend had told me that this was one of his favorite recent IPAs so I was excited to see what they could do. I like to see some of the bigger craft breweries making IPAs widely available now because many of them only ever really shipped their lighter brews nationwide. Upheaval pours a nice amber color and has a good strong hop flavor. I tasted some prominent cluster hops along with some citrus, pine, and tropical fruit. It has a good amount of bitterness and was overall quite satisfying. 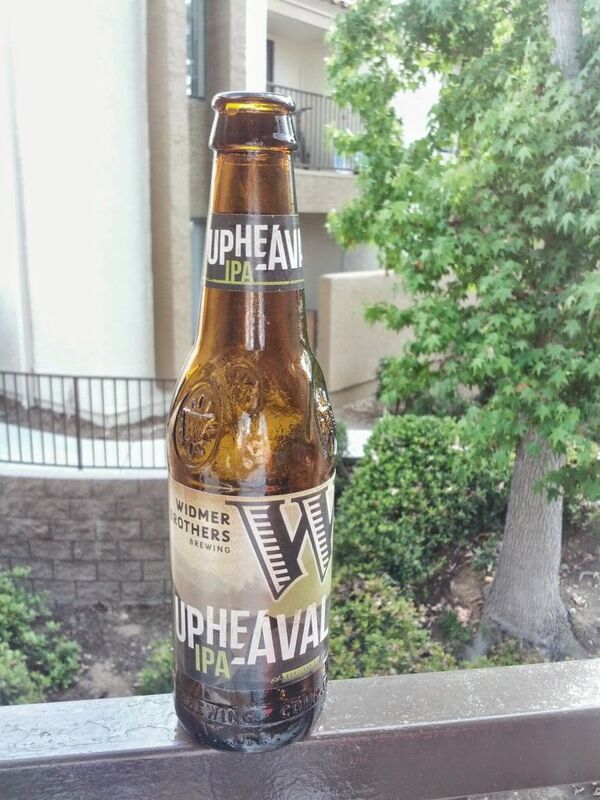 The upheaval tasted a lot more fresh than the Rebel I tried recently. The date I saw on the bottle appeared to be a “bottled on” date, which I prefer to see on my beers. If you see this on sale at the grocery store, check the date for freshness and then go for it. 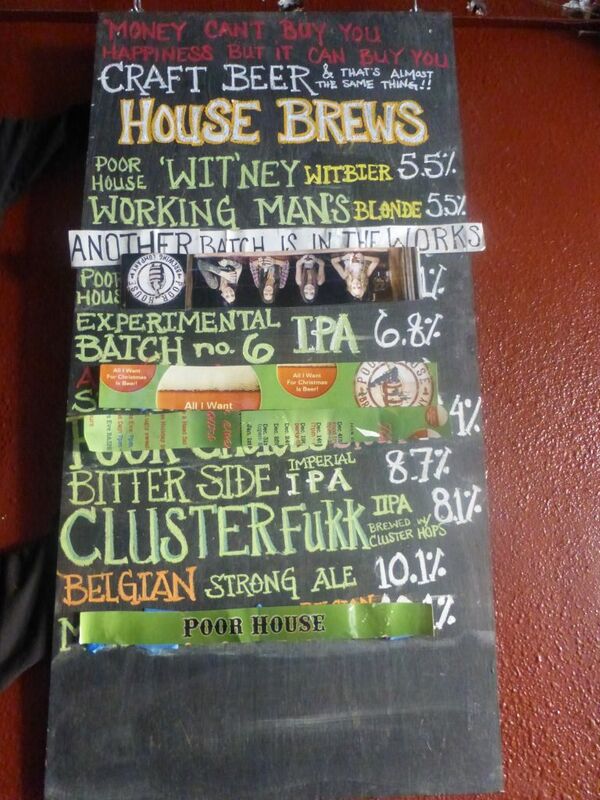 Poor House had a smaller taplist and so I didn’t try as many. I stopped by here on my way home from Thorn Street Brewing so I didn’t try as much as I might have if this was my first stop. I ended up with three tasters, the Experimental #6 IPA, the Bitter Side Imperial IPA, and the Cluster Fukk IPA. Keep in mind this brewery only accepts cash, which I haven’t seen at any other brewery in San Diego before. Also, they serve their beers in mason jars. 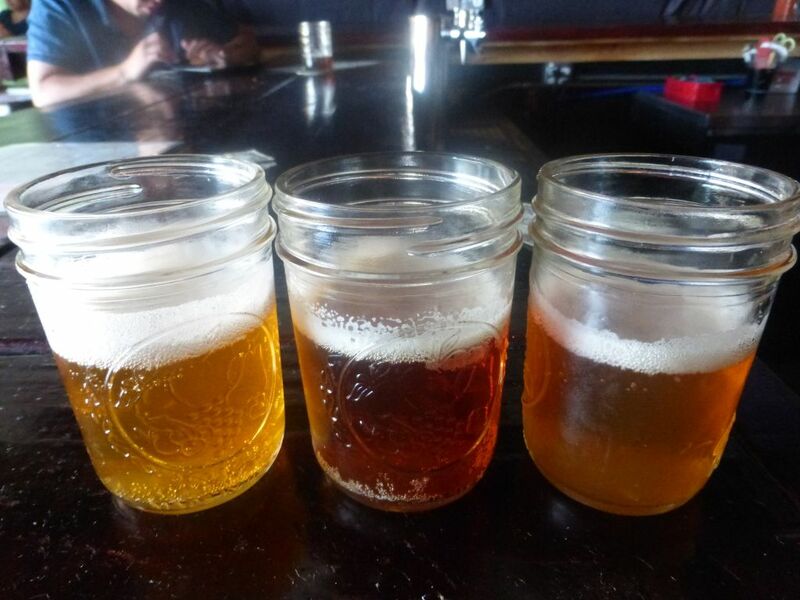 The tasters are smaller mason jar pours. The Experimental #6 IPA was quite impressive. It had all the flavors I come to expect from San Diego IPAs with some nice grapefruit flavors at the front. It is a nice light colored IPA and quite tasty. The Bitter Side Imperial IPA was tasty though a bit heavy on the malts for me. It mostly had a strong caramel malt flavor at the front with some tropical fruit hops at the back. It is pretty low on the bitterness so it should hopefully satisfy hop fans who don’t like bitter. I really enjoyed the Cluster Fukk. The flavor that came through strongest was lemon, most likely from the Cluster hops. It made the beer very crisp and refreshing. This one was my favorite of the night followed by Experimental #6. 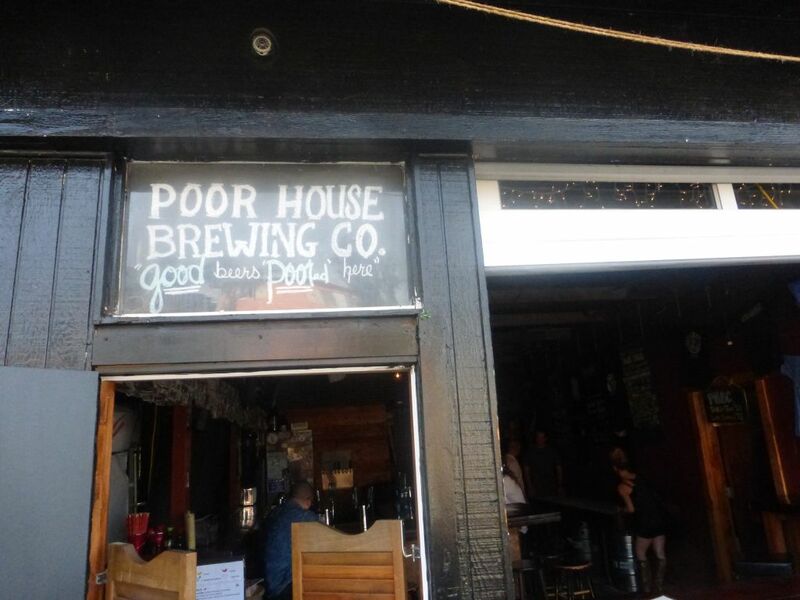 Though Poor House didn’t have any stouts of porters when I was there, they said they do tend to have some versions of one or the other at times. I was quite impressed by the IPAs they had on tap. 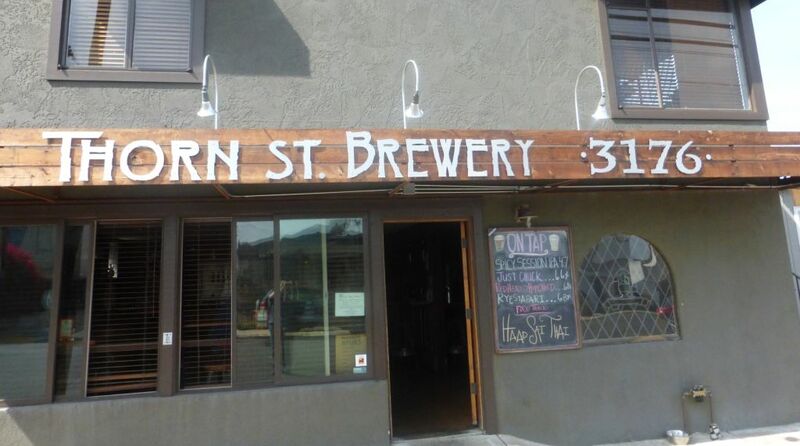 Thorn Street Brewing has a relaxing atmosphere and many delicious beers for every taste. 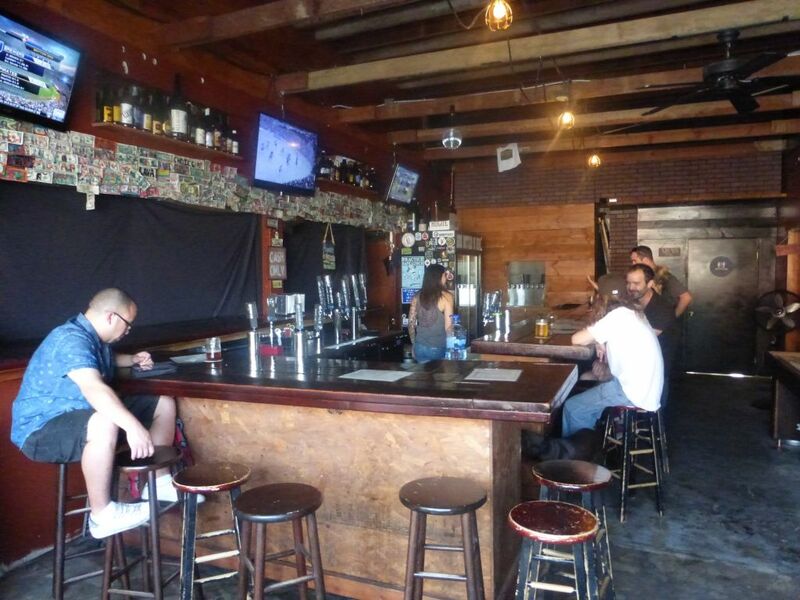 I decided to stop by after a failed attempt to visit Mission Beach left me frustrated and in need of a beer. With so many beers on tap, I didn’t get to try every one but the ones I tried gave me a good taste of the selection. To start with, I tried their Session IPA, a Spicy Session IPA, and the Oatmeal Stout. The session IPA had a nice pine flavor with some nice citrus, similar to the Lagunitas Session. It is mellow enough that it should be nice to drink on the beach. The spicy session was a bit on the hot side, which surprised me. It wasn’t as hot as the Habanero Sculpin but still hotter than a lot of other similar beers. The oatmeal stout had a nice mellow flavor with some sweet caramel and hints of chocolate. This one would likely satisfy fans of the style. Next I got tasters of the Relay IPA, Tropic Daze IPA, and Red Headed Hop Child. The Relay had a nice crisp flavor to match the light color. It was more piney than citrus though it did have a light citrus on the back. The Tropical Daze had a heavy tropical fruit flavor with a bit of pineapple flavor up front. This was one of my favorites of the night. The Red Headed Hop Child disappointed me because it was a lot heavier on the malts than the hops. I thought it could use a lot more hops so what I had didn’t satisfy me at all. To finish it off, I had some Rye Stafari, Menace, and the Barrel Aged Imperial Porter. The Rye Stafari gave me a heavy dose of smoke with roasted malts up front. It was pretty boring and dry tasting and didn’t impress. The Menace was almost a double version of the Tropic Daze though it did have some other varieties of hops to give it a different flavor. This was an impressive double IPA that went down smooth. The Barrel Aged Imperial Porter had the right amount of bourbon flavor to match the sweet coconut and went down smooth. 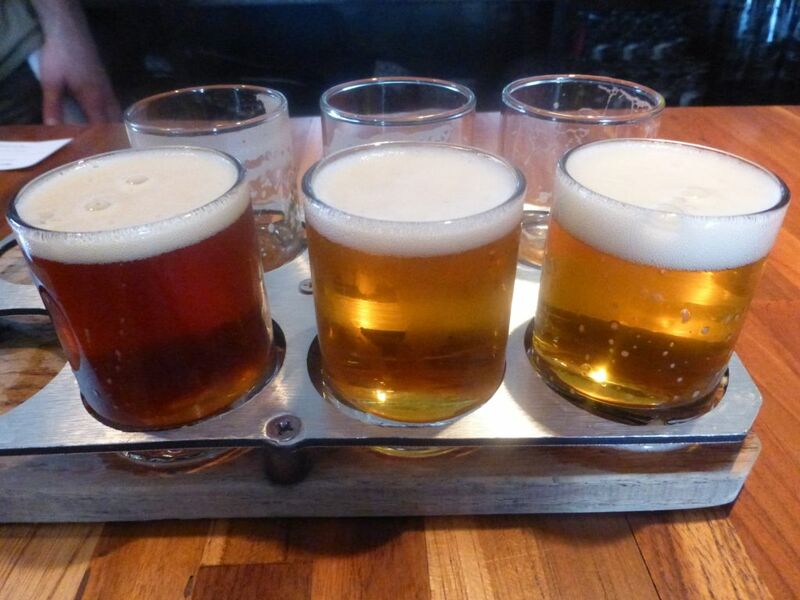 IPAs have become so popular that everyone wants a piece of the pie. Samuel Adams decided to make a West Coast style IPA so I had to give it a try to see if it was any good. I question the use of the name rebel to describe it because it has almost become an act of conformity to make an IPA in this style. Still, this beer has an alluring packaging and claims to use many of the hops that are popular on the west coast. Is it any good? 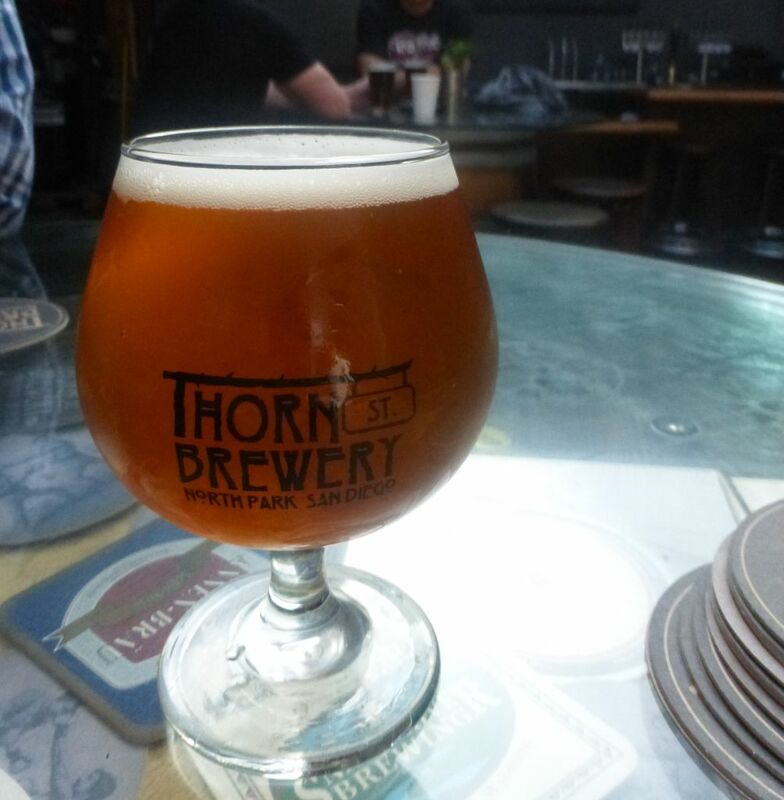 The rebel IPA pours a light amber color and has a strong pine scent on the nose. The first thing I tasted was a strong malt flavor with some pine hops. I checked the bottle and noticed it is one month away from the enjoy by date. This tells me that this beer might have had a bit more citrus flavor if I had tried some sooner after the release. Still, my second beer had a bit more citrus flavor and both had plenty of hop flavor. 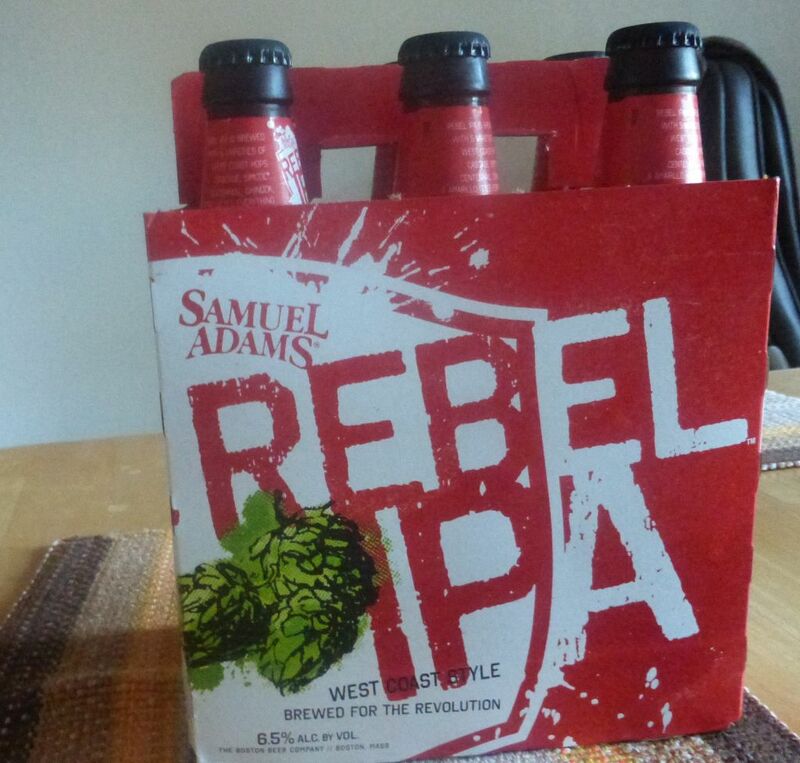 Considering my general dislike for all things Samuel Adams, the Rebel IPA is surprisingly good. It didn’t blow me away as much as my favorites but the freshness could be a big factor in that. It is as close as I have tasted from Samuel Adams to the West Coast style and for that I applaud them.